On the occasion of the feast day of St. Barbara we offer the following homily by Igumen Melchizedek (Artiukhin), rector of the Church of Sts. Peter and Paul in Yasenevo, the Optina Monastery’s metochion in Moscow. Dearly beloved Fathers, brothers, and sisters! I cordially congratulate you all on our feast day, the day commemorating the Holy Great-Martyr Barbara, to whom a side chapel in our holy church is dedicated and a portion of whose relics, by God’s mercy, are here as a consolation, a special mercy of God, and a token of her special intercession for our church. Special, unseen Divine grace flows forth from these sacred objects – from the Holy Table, from her relics, from her icons – to sustain each one of us on our life’s journey. May the fervent prayer of the Holy Great-Martyr Barbara – who, according to the tradition of our Holy Church, preserves the holy race of Orthodox Christians from sudden death – be with you! Today’s prayer [to St. Barbara] expresses the faith of our Holy Church: “And grant us a Christian ending, painless, blameless, peaceful, with the Communion of Christ’s Mysteries.” Each of us will have to be born into Eternity, for no one is eternal. The Lord says: “As I find you, so will I judge you.” God has not saved anyone from this temporal death, but he has saved us from eternal death. Who we will be there, in Eternity, depends on us. Therefore the Church, the Holy Mysteries, Confession – this is the path to Eternity. Therefore we pray to the Holy Great-Martyr Barbara that our end might not be without Communion of Christ’s Holy Mysteries. One sows what one reaps. If one lives through the Church, then one will ascend to heaven with the Church. But what happens to someone who lives through this world is unknown. 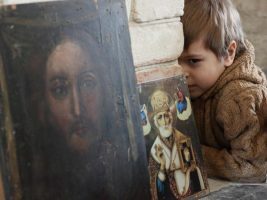 The Elder Ambrose of Optina said: “The world promises gold, but gives mold.” And St. 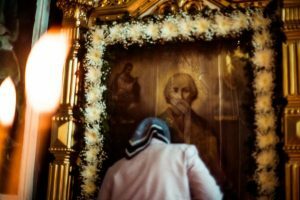 Basil the Great said: “Let us do immediately, right this moment, that which will lead us to Eternity!” The great God-pleaser, St. John of Kronstadt, performed such miracles. One handmaiden of God who had carefully read St. John’s life told me about how he once visited a city on the Volga. At one location – perhaps at the source of the Volga, where it is not very deep – the following took place. A ship had gotten stuck in a shallow spot and could not move any further, because the summer had been drought-ridden. Fr. John had come for a church’s patronal feast day. The peasants and many people who were nearby asked him: “Batiushka, pray that it would rain and that the water would rise in the Volga, so the ship could pass.” (In earlier times, inasmuch as there were few railroads and there were no highways, rivers were the main means of transport.) St. John began to pray and the river, in the sight of all, slowly began to rise. In an hour the ships that had been stuck in shallow water began to move along this river. The people, awestruck and grateful, began to glorify God and his great saint. Some time later, they asked Fr. John: “Batiushka, how have you been vouchsafed such great Divine grace?” And he revealed the secret, which turned out to be very simple. He said: “I lived in the Church!” That was the entire answer. He lived with God, he breathed God, and he served the Liturgy every day if not sick. 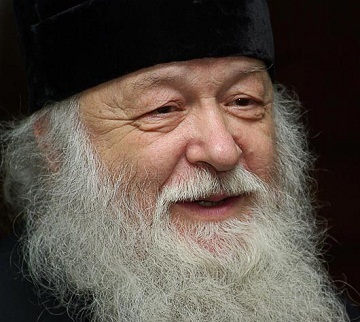 He said that he considered any day in which he did not pray at the Divine Liturgy to be a loss for his life. Hence his great gifts: it is neither through television, nor newspapers, nor the news, neither in front of the computer nor at work, that the grace of the Holy Spirit is acquired. These are just means to go on living. But the Church is life itself. Therefore, let us not exchange gold for trinkets. Let us breathe the air of eternity, which can only be found in church. Through this, even if we do not acquire similar gifts, we can at least partake of that grace of God, of that eternally exultant life, that the Lord grants abundantly to each of us during every church prayer. He is ready to bestow upon us His heavenly, divine, all-illuminating grace, if only the vessel of our souls would be prepared to receive it. If, from Communion to Communion, we will carry out our lives as Christians with this feeling of humility, then the Lord – Who resisteth the proud, but giveth grace unto the humble [cf. James 4:6; 1 Peter 5:5] – will liken us unto Himself and the saints. 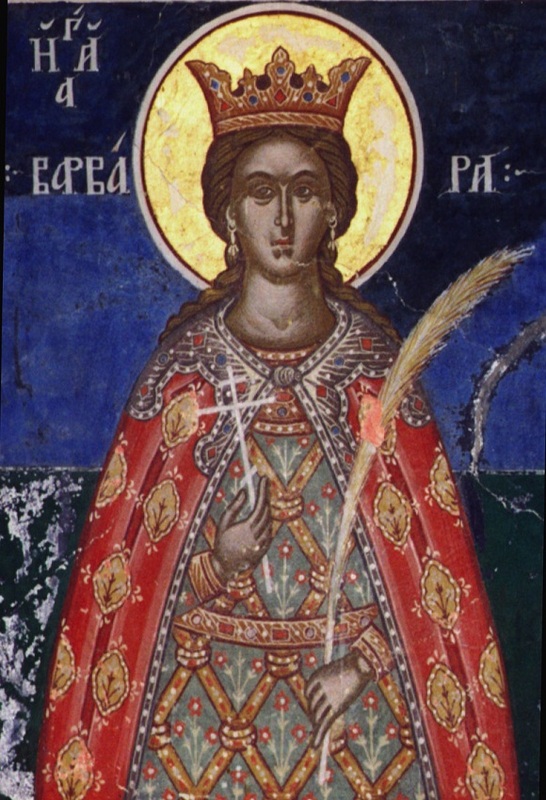 And, through the prayers of the Holy Great-Martyr Barbara, may the merciful Lord grant us to love the Church of Christ as did the saints, to have the zeal for prayer and the spiritual life as did the saints, and to love and live by the Gospel as did the saints along with the Holy Great-Martyr Barbara, whom we today glorify. 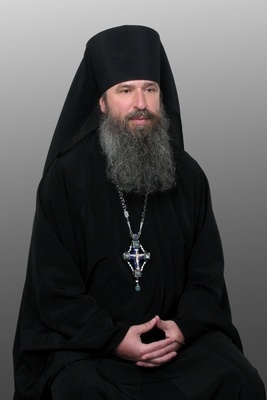 Through her holy prayers, may the Lord keep our Holy Orthodox Church unwavering in faith, support the elderly, make wise the young, preserve families, grant godly zeal to pastors, and lead us through repentance and wholehearted love for Almighty God to ever-exultant Eternity, where there will be neither tears, nor sickness, nor sighing, but life and joy everlasting. Amen.